Head to the top of Twin Peaks San Francisco for some of the best views of SF and the entire Bay Area. At more than 900 feet above sea level, these two hills offer views of the Golden Gate Bridge, Alcatraz, downtown SF, Angel Island, and so much more. Read on for tips on how to get here, hikes around the area, maps, parking, tours, and everything else you will need to visit. I've also included some tips for those that want to visit at night. It's a must see on your stay in the SF Bay Area! Twin Peaks San Francisco is the second highest summit in the city. However, it's the most popular due to its central location and unobstructed views all around the SF Bay. It's part of a 31-acre Twin Parks Natural Area and is free to visit 365 days a year. How high is Twin Peaks San Francisco? Both summits sit at 922-feet above sea level. With no trees or buildings in the way, you get 360-degree views from its summits all around SF and the entire Bay. However, you don't have to climb to one of the summits for a great view. You will get a 180-degree view from its parking lot which faces north. From here, you can see the Golden Gate Bridge, Alcatraz, the Bay Bridge and downtown SF. Here are just a few of my pictures from my last visit. This is a view of the Golden Gate Bridge from Twin Peaks San Francisco. This is what Alcatraz looks like from the summit. It's on the list of "The Seven Hills of San Francisco." These are the 7 most famous and highest peaks in SF. In total, the city has 43 named hills. It's the second tallest peak in SF. The only taller one is Mount Davidson, which is 928 feet high. It's just 6 feet taller, but is covered with trees so does not have the 360-degree views offered here. The northern peak is called "Eureka" and the south peak is called "Noe." Christmas Tree Point is a third summit here. 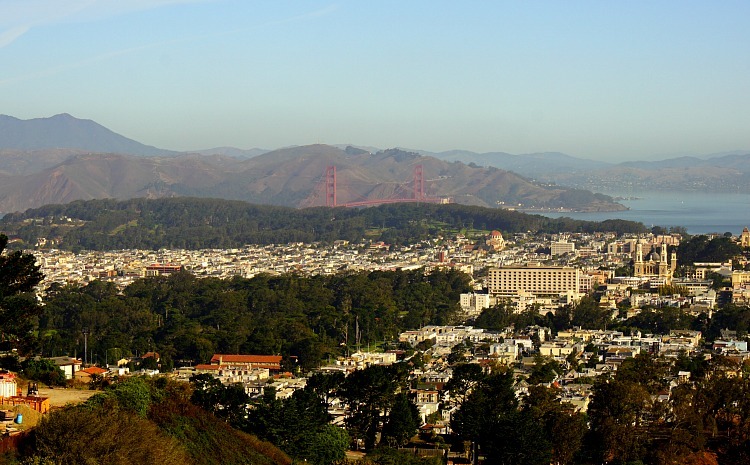 It isn't as high as the two main peaks, but is on the northern side of the park and offers great views of downtown, the Golden Gate Bridge, and Alcatraz Island. It's also where you will find the main parking lot. It's home to the mission blue butterfly, which is on the endangered species list. The city released 22 pregnant mission blue butterflies here in 2009 and it's one of the only places in the area that they thrive. Be on the look out for them during your visit and make sure to check out the newly updated trail that takes you close to their habitat. It's one of the stops on the famous 49-Mile Scenic Drive around SF. 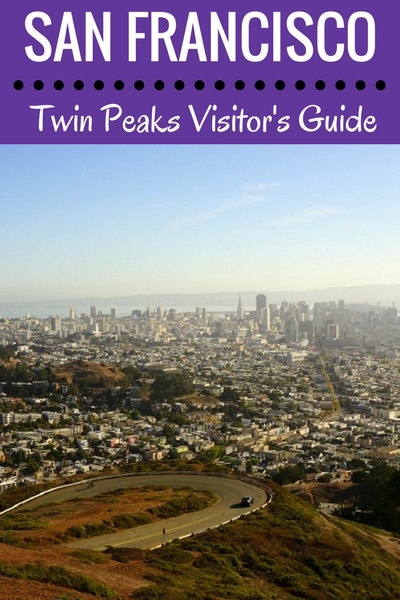 If you plan to visit Twin Peaks San Francisco, you will want to prepare a bit for your time here. Due to its height, you will often find more wind up here and a temperature drop of a few degrees at its summits. In the summer, the peaks are often a natural barrier of the fog between the western and eastern sides of the city. During this time of year, you will find more fog as you face west and clearer skies as you face east. Make sure to bring along a light jacket or wind breaker to stay warm. Also, bring along an umbrella that does well in the wind during our cooler winter months. You will also find that the trails can get a little muddy during our rainy season (November - March), so make sure to wear shoes that you don't mind getting a bit dirty during this time of year. Here are more tips on what to expect from the weather here each month of the year. Twin Peaks San Francisco is open every day of the year. It's free and you can visit between 5am and midnight. You can get here by car, on foot, by public transit or on a tour. See the details in the sections below for more details on each option to get here for a visit. Here are just a few other tips for visiting. Visit Length: Most people spend between 30 minutes and an hour during their visit. Comfy Shoes: If you plan to hike up to the summit or around this area, make sure to wear comfortable shoes. The stairs are step and can be uneven in places. Even though they are well maintained, it's best to wear flat soled shoes that will allow you to walk around easier. Eastern Loop Closed: One of my favorite changes to this popular SF attraction is that they have closed off part of the road to make it safer for pedestrians. You can now walk from one summit to the next without having to wait or watch out for cars. The area that's now closed to car traffic is the eastern loop of the figure 8 at the top. Restrooms: You will find restrooms near the northern parking lot. No Other Services: You will not find any other services here such as hotels, restaurants, or activities. The draw here is the view! Can you visit Twin Peaks San Francisco at night? YES! This popular attraction is open until midnight every day of the year. This means, you are able to access it at night to get amazing pictures of downtown SF at sunset or when its dark. If you plan to visit after the sun goes down, I recommend driving and parking in the northern parking lot instead of hiking to the top. It is a safer option and will ensure you don't encounter any issues trying to hike the trails at night. This area is safe, but you can't always see the trails that well at night, so it's best to drive up here once it's dark. Once you arrive, you are then free to hike to the top of the summits. Make sure you are out of the park by midnight. Instead of going on your own, you can also head up to Twin Peaks San Francisco at night with this fun tour. In addition to a stop here, you will also stop at Coit Tower, the Palace of Fine Arts, and the Golden Gate Bridge. This night tour also drives by several other top attractions such as the Civic Center, the Castro, Union Square, North Beach, and the Haight Ashbury. This 2.5 hour tour runs a few nights a week. The official address is 501 Twin Peaks Blvd San Francisco, CA 94114. 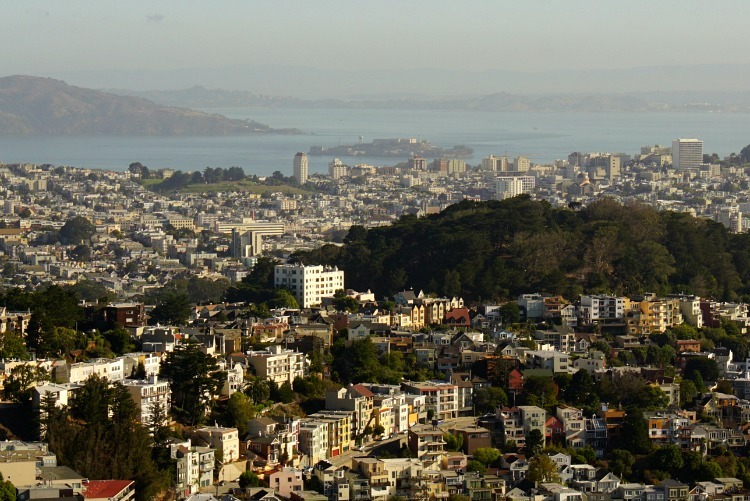 It's in the heart of the city and easy to find with Sutro Tower (red and white tower) that stands high above the peaks. Here is a map of the 31-acre area. The blue star shows the northern summit and the red star shows the southern summit. The smaller purple star is the main parking lot. You will find a parking lot on the northern side of the summits. The parking lot is small (less than 30 spots total with a couple of handicap spots), so make sure to arrive early or plan to wait in your car for up to 30 minutes before a spot opens. If you are up for a hike to the top, you have a few other parking options. In the section below, I've outlined the trail details so you know what it will take to get to the top from these additional parking options. If you plan to drive, you will find a few options to get to the parking lot here. I recommend using Google Map to find the best route. However, do not use the official address to find the parking lot. This will only take you to the entrance. The best way to find it on Google maps is to plug in "Christmas Tree Point Road." This will give you proper directions all the way to the main, small parking lot on the northern side of this attraction (shown on the above map with the purple star). Are you interested in a hike while you are here? If so, you are in for a treat. The trails here are not long, but you will get in a great workout as the trails are steep. You can either hike from the nearby neighborhoods or park in the parking lot and just hike to the top or both of the summits. The main hike up and down the summits is around 0.7 miles one way. Here is a picture of the trail to the top of one of the summits. They are both similar with mostly steps to the top. You can extend your hike by parking below and taking one of two main trails up to the peaks. One is along Crestline Drive. This is the one we usually use. There is plenty of parking down here and it's also where the bus stop is located (37 Corbett - see section below for tips to take the bus to this trailhead). You will climb up the eastern side of the hill and then make your way to the summits. This trail is not much longer, but it's steep and it will get your heart pumping. 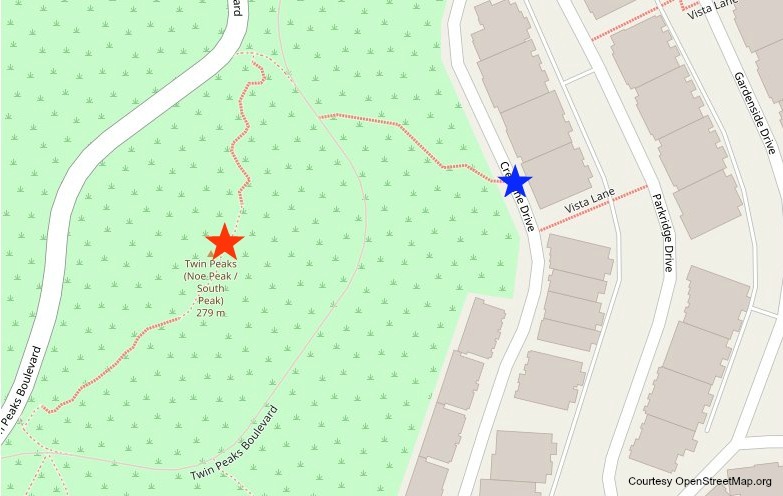 Here is a map to show you where to find this trailhead to the top. The blue star shows the trailhead. The red star shows the southern summit. There is another trail that comes in from the south. It starts near Portola Drive and Twin Peaks Boulevard. 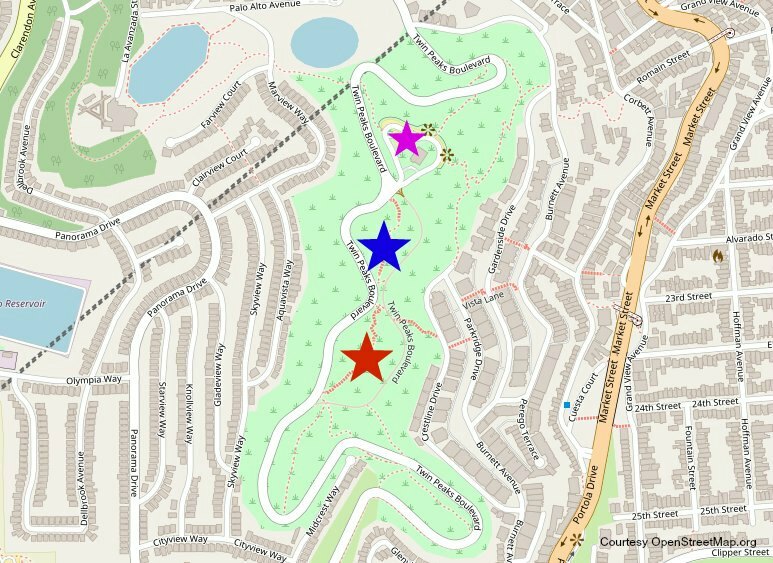 I recommend parking on Twin Peaks Boulevard or in the neighborhood on either Panorama Drive or Midcrest Way and walk over to the trailhead. You can also take the bus to this trailhead (36 or 44 from the Forest Hill Station -- see my write up below for details on how to get here by bus). You will find the trail on the other side of the silver railing along Twin Peaks Boulevard (on your right as you face up hill toward the summits). 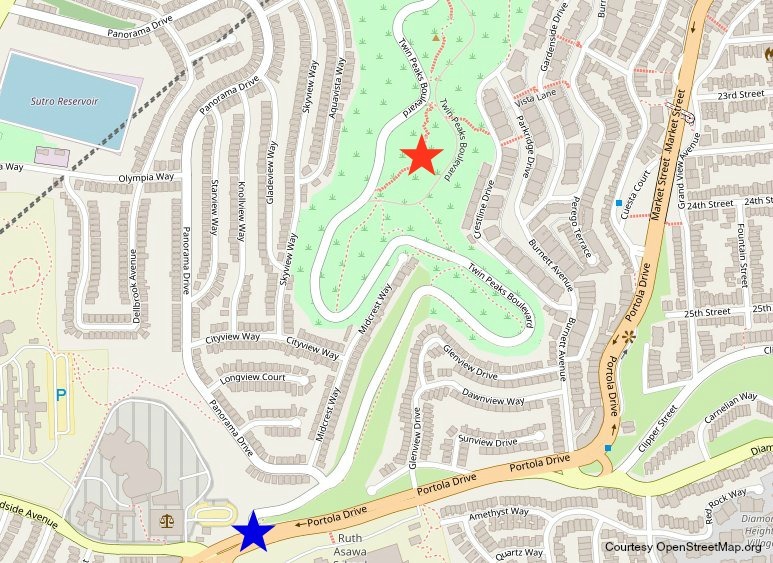 The best place to pick it up is at the start of it on Portola Drive at Twin Peaks Boulevard. This one is longer than the Crestline trail, but does not start out as steep. The total distance for this one is about 1.5 miles one way. Here is a map that shows you the trail head. The blue is the trailhead and the red is the southern summit. The city is continually making improvements to the trails here including updating the staircases as well as a trail that will get you closer to the mission blue butterfly habitat. In additional to exploring on your own, you will also find a cool guided tour that includes some time to explore Twin Peaks San Francisco. The tour is called Hills and Hidden Gems. 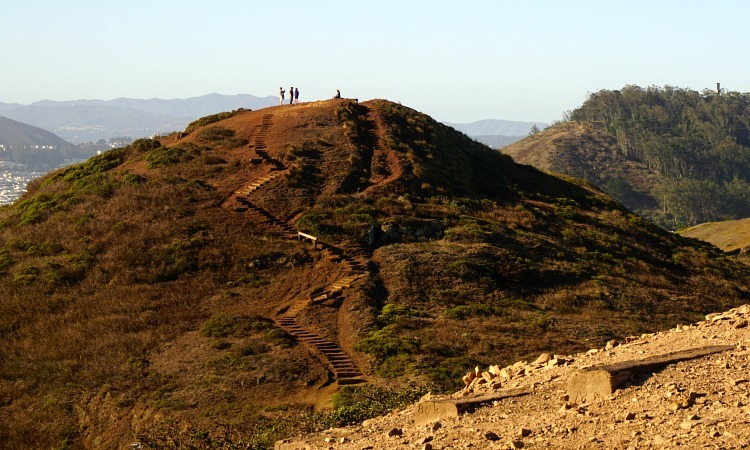 On this 3-hour hiking tour, you will not only hike to the summits here but you will also summit two other local gems called Kite Hill and Tank Hill. You will walk through greenery, hidden parks, and well maintained trails. As you hike, you will also learn about the local habitat, some of the history of each location, and urban legends! This tour runs a few days a week at 9am and 1:30pm. There are plenty of bus and city tours that visit Twin Peaks also. Here are a few of the top options. 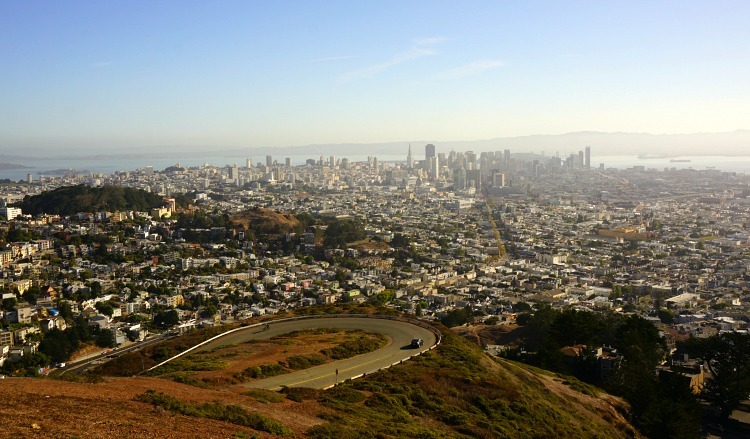 This 3.5 hour tour offers you the chance to see the summit of Twin Peaks San Francisco (weather permitting) as well as several other top attractions in SF. You will also see the Golden Gate Bridge, cruise through Chinatown, and see Fisherman's Wharf. As you ride around on this comfy bus, you will also learn about the history of SF, fun facts about each attraction, and a few hidden gems. This tour runs most days at 9am and 2pm. This all day tour includes a similar SF city tour as outlined above. After you are done exploring SF, you will head north over the Golden Gate Bridge to check out both Sausalito and Muir Woods. The tour lasts around 8 hours and runs most days of the week. In addition to the Twin Peaks San Francisco tours, you can also get here on public transit. It does take a little more hiking to get to the top, but it's a fun way to visit. You can also visit by using Lyft or Uber. You have a few options to get here on public transit. None of them will take you to the top, but instead will take you to the trailheads where you can then use the trails to get here. This bus has a short route and it will take you to the start of the trailhead on Crestline Drive. There are two stops that get you within a couple of blocks of the trail head. The stop I usually use is the one at Parkridge and Crestline. From here, head over to Crestline Drive and find the stairs leading up to the trail. When you get on the bus, you can also ask the bus driver to tell you which one is your stop. They are often friendly and are happy to help. To get to this bus, take public transit to the Castro Street Station and then transfer to the 37. F Streetcar: This will take you from Fisherman's Wharf all the way to the Castro. It's a slow ride, but a fun way to see quite a bit of the city. KT, L & M: All three of these Muni trains will also take you to the Castro Street Station where you can then transfer to the 37 Corbett bus. A second option is to stay on the KT, L or M trains to the Forest Hill Station. You can then transfer to either the 36 or the 44. Take them just under a mile to the Woodside Avenue and Portola Drive stop. From here, you would walk to Portola Drive and Twin Peaks Boulevard to start your hike to the top. This is a longer route and from this stop it's almost two miles one way. If you are in for a longer walk, you can also walk from the Forest Hill Station to Twin Peaks San Francisco. This is about a three mile walk one way with quite a bit of uphill walking, but it's an amazing walk that I think you will love. If you don't want to climb to the top, but also don't want to rent a car, consider using Lyft or Uber to get here. Take the Muni to the Castro Street Station or the Forest Hill Station and then contact them from here. This will cut down on the cost to get to the top. It's then an easy walk down with gorgeous views or you can call a Lyft or Uber to pick you up when you are ready to leave.